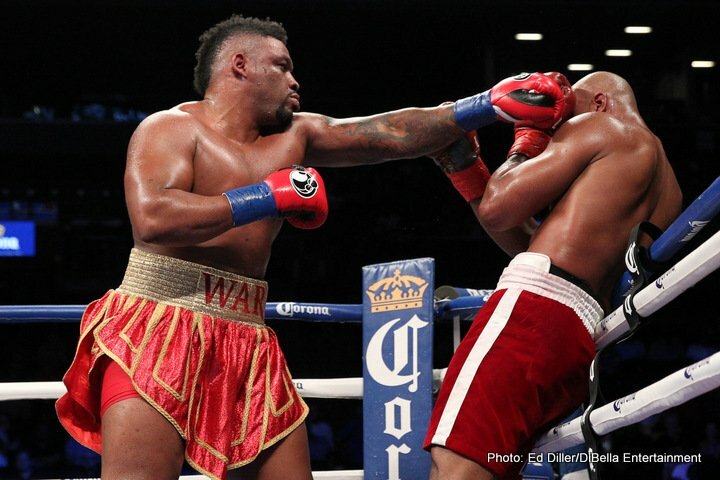 By Jim Dower: Jarrell ‘Big Baby’ Miller (21-0-1, 18 KOs) is reportedly not interested in traveling to Bulgaria to face former heavyweight world title challenger Kubrat Pulev (25-1, 13 KOs) in an IBF title eliminator, according to Dan Rafael of ESPN. The winner of the fight will be the mandatory challenger to IBF heavyweight champion Anthony Joshua. Miller has never had to travel outside of the U.S to take a fight before during his nine-year pro career. It looks like he’s not going to risk fighting Pulev outside of the U.S.
Epic Sports recently won the purse bid with a winning bid of $2 million for the Pulev vs. Miller fight, and they had plans on staging it in Bulgaria. However, it appears that the 29-year-old ‘Big Baby’ Miller has no intention of going to Bulgaria to face Pulev. If that turns out to be the case, then it would be the second contender that chose not to face the 37-year-old Pulev in the IBF title eliminator in Bulgaria. Dillian ‘The Body Snatcher’ Whyte recently chose not to accept the fight with Pulev in Bulgaria after Epic Sports beat out his promoters at Matchroom Boxing with a winning bid. If Miller doesn’t take the fight with Pulev, then the next likely contender in the International Boxing Federation’s top 15 rankings is Trevor Bryant. It’s doubtful that Epic Sports is going to agree to have the Pulev vs. Miller fight take place in the U.S after they put a lot of money in winning the purse bid. Why would they agree to stage the fight in the U.S if the idea was to place it in Bulgaria? It doesn’t make any sense at all. The winner of the IBF title eliminator still won’t get a shot against IBF heavyweight champion Anthony Joshua for 18 months. Miller, 6’4”, has a good chance of getting a fight against Joshua even without taking part in a risky IBF title eliminator against Pulev, so it’s not really worth it for him to take the fight. Pulev would get a 75/25 purse split for the Miller fight. That’s another thing that makes it tough for Miller to take the fight. It might be for the best that Miller not accept the fight against the 6’4 ½” Pulev, because there’s a good chance that he would lose that fight. Miller looked terrible recently in struggling to beat former heavyweight world title challenger Johann Duhaupas last April. Miller won the fight by a lopsided 12 round unanimous decision, but the fight was closer than the scores turned in by the judges. Miller might not believe that he can beat Pulev. It’s a fight that makes sense for Miller to take if he wants to ensure that he gets the most money possible for a title shot against Joshua. There’s a big difference between facing Joshua as a mandatory challenger compared to as a voluntary challenger. It would be a shame if Miller bypasses the IBF title eliminator with Pulev and then loses out on a potential chance to look himself in as the IBF mandatory to Joshua. At some point in Miller’s career, he’s going to need to be open-minded about fighting outside of the U.S.
« What next for AJ and Wilder?